This fourth edition of Practice Notes on Consumer Law contains much useful information for those dealing with problems in consumer law, from either the consumer or supplier perspective. These notes include guidance on common problems, checklists, specimen letters and precedents to help you through the common problems in this area of law, which has recently changed so rapidly. Consumer Law covers contract, tort, consumer credit, and consumer safety. Each of these areas has seen huge changes in the ways business is done, largely as a result of changing technology, enabling people to buy goods and services in new ways, including via the internet. That technology can, in itself, be the cause of difficulties, where it goes wrong, or where suppliers have inadequate systems to deal with customer. Both suppliers and consumers need advice on how to deal with the problems that arise. 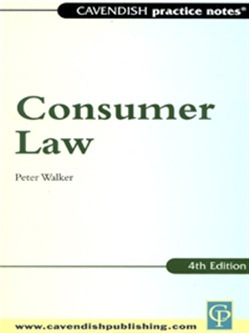 This fourth edition has, therefore, been updated to include: developments such as the Unfair Terms in Consumer Contracts Regulations 1999, and the Contracts (Rights of Third Parties) Act 1999 changes in consumer safety law, particularly the regulations concerning general product safety changes in civil procedure as a result of the Woolf Reforms - the book includes procedural notes relating to litigation the influence of the European Union, particularly consumer protection for distance selling contracts. Acquista Practice Notes on Consumer Law in Epub: dopo aver letto l’ebook Practice Notes on Consumer Law di ti invitiamo a lasciarci una Recensione qui sotto: sarà utile agli utenti che non abbiano ancora letto questo libro e che vogliano avere delle opinioni altrui. L’opinione su di un libro è molto soggettiva e per questo leggere eventuali recensioni negative non ci dovrà frenare dall’acquisto, anzi dovrà spingerci ad acquistare il libro in fretta per poter dire la nostra ed eventualmente smentire quanto commentato da altri, contribuendo ad arricchire più possibile i commenti e dare sempre più spunti di confronto al pubblico online.